This week we had the opportunity to cast our vote. Watching the democratic process is truly an amazing part of our country’s DNA. One of the important passages for any American young person is the first time they join the ranks of the adult world and cast their vote as a responsible citizen. My son Robert voted for the first time this year. I picked him up from school and took him to the polling place, his former elementary school. As we walked into the school he remarked that it was very familiar and yet so different. He commented that it looked smaller than when he was younger. On that day he was not a student but a citizen casting a vote that would determine the next leaders of our nation. I told him what line to get in and checked to make sure he had his voter identification card and his driver’s license. Then I told him that he was on his own. His vote was his to cast as he saw fit. There was a sacred sense in it all. Our sophisticated system of vote counting did not leave us wondering who would win for very long. That same night, we watched as the winner was declared and the looser graciously conceded. This seamless process of the transition of power is what makes this such an amazing country. As I watched President-elect Obama and his family take the stage there was this great sense of history. It was in a profound way a triumph of our value that “all men are created equal”. One of the ugliest parts of our nation’s history is the story of racism. There is no way I can as a white man I can ever fully understand the wounds inflicted on those who were the victims of this kind of prejudice. Watching the tears of those who do understand moved me. President-elect Obama summed up this amazing passage when he told of the black woman over 100 years old who had cast her vote for him. She has lived through times when not all people were treated with the equality and respect that all human beings deserve. There were times when a black man could not sit anywhere he wanted on a bus, use any bathroom or be served in any restaurant he might choose. She marveled that she had lived to see the day that she could vote for a black man to be the President of the United States. I pray that the election of President Obama will serve to heal wounds in this nation that have for too long marked us. It is now my responsibility as a Christ follower and an American citizen to pray for our new President. We are commanded to pray for those in authority. Our leaders succeed better with our prayers. There is this attitude of honor and respectful support that is both cultivated and expressed when we pray for our leaders. One of the great mysteries of being both a Christian and a citizen is this idea that we choose, but that God sovereignly directs that choosing. It is God who puts a man up. It is my privilege to be part of President-elect Obama’s prayer team. My prayer has been specifically that as the mantle of leadership falls on him that he would in that very lonely place realize that he needs Divine wisdom and guidance. While the President is constantly surrounded with people he is also very much alone. I pray that he will early on look to God for direction and be strengthened supernaturally as he leads. I also pray that God will bless his precious family as they transition into the unique setting of the White House. 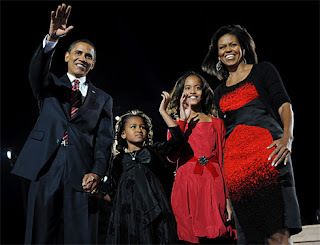 May God bless President-elect Obama and his family. And may God bless America. Thank you for this great blog. Mr. Obama was not the one I would have chosen, but I ,too will be praying for him. I join you in praying for our new President, I trust all followers of Christ will commmit to do the same. Pastor, thanks for this blog. I have really been struggling with praying for him as our leader. I am fearful of where he may take our country, and tend to forget that God is the one who leads, whether thru a man of God, or thru someone else. I will be praying for him, and for God's continued blessing on our country. I needed to read this today, thanks again for the reminder that the commandment to pray for our leaders does not only mean when our guy wins.